Calum sits within our Litigation & Dispute Resolution Team specialising in residential property disputes. He also provides assistance with commercial property disputes, contentious probate and personal injury claims. End of a “golden” era? Calum graduated in law from the University of Central Lancashire in 2009, before completing his Legal Practice Course at the same university in 2010. He then went on to complete a training contract at Brockbanks Solicitors in Cumbria, qualifying as a Solicitor in July 2013. Remaining at Brockbanks Solicitors until 2016, Calum specialised in both civil and criminal litigation. He worked on some high profile cases in West Cumbria and developed a strong reputation with both clients and peers in the area. 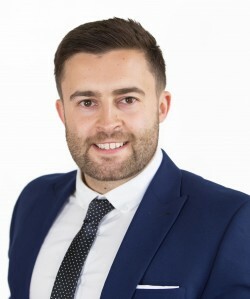 Calum joined the Litigation & Dispute Resolution Team at Leather Prior in April 2016. He specialises primarily in residential property-related disputes including landlord and tenant disputes, possession proceedings, rent arrears, lease extensions, forfeiture, rights of way, right to light, boundary disputes, easements, restrictive covenants, assured shorthold tenancies, assured tenancies, adverse possession, trespass and nuisance. Calum also deals with contentious probate and will disputes. His work includes advising on areas such as lack of testamentary capacity claims, undue influence claims, lack of knowledge and approval, claims against executors, Inheritance claims and including challenging a Will. Alongside property and probate disputes, Calum also deals provides assistance with a range of personal injury claims including road traffic accident, employers liability, public liability and medical negligence claims. Outside of work, Calum is passionate about strength & fitness training and nutrition. He has also been a keen golfer from an early age. Calum is involved in supporting the local community; attended secondary schools and providing careers advice and talks to pupils interested in pursuing a career in law. Thank you very much to you and Darren for all your assistance at what has been a very difficult time for me and my family. You have given excellent legal advice alongside being sympathetic and understanding at all times. Praised for efficiency and technical expertise.